A good classified site make you different from others and sometimes it was the main reason behind the success. So here the listing some exclusive WordPress themes for classified sites. All of the themes have modern features well crafted and having strong customer service. The main things of any classified site is too well organized good looking and user-friendly. Here try to listing of that classified site. Really you will get a opportunity to choose the best WordPress theme for classified website !. 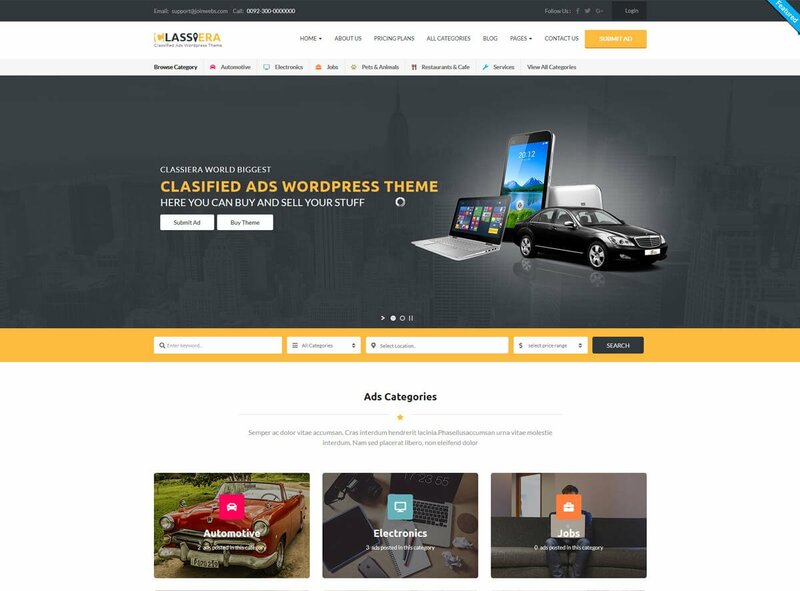 Classifieds is come with eye-catching flexible WordPress theme for classified website. The site is looking simply awesome along with many features and it makes user-friendly for the users. You will get search option for seeking any product and also will get location map. All of this are the key features of any classified ads site. You have the opportunity to set thousands of product and make all of the product in different category. 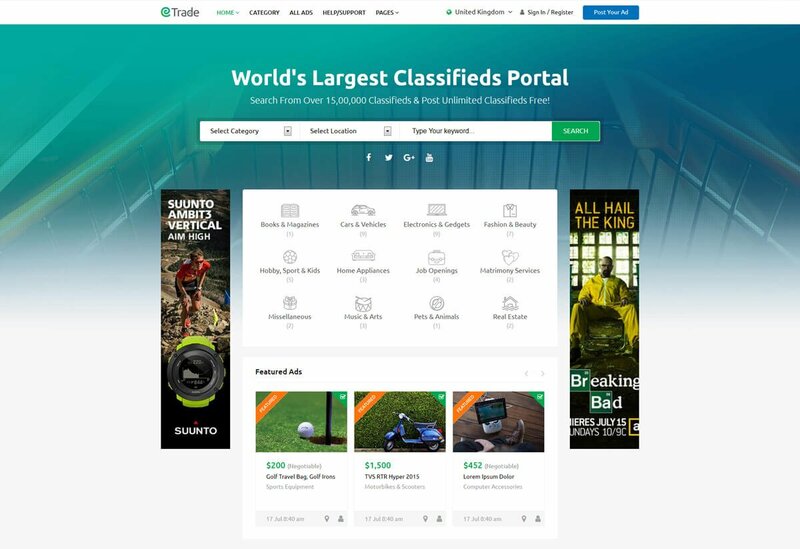 Classifieds is the latest version and it always get in touch with modern. You will get all the update version if you are purchasing this classified site. Classifieds has dedicated team who always ready to get in touch with their valuable customer when they are facing any trouble regarding this theme. Let’s see the Classifieds features! AdForest is a responsive well polished theme among the WordPress themes for classified sites. It has pre built “SIXTEEN” home page and really a great option for the customer to make their desire website. This facility is a rare, only quality themes have. AdForest always try to get change with the modern trend. Therefore, you will get latest version 3 and time to time it will be updated. You will get awesome function like when you post any ad, you have the option to change color of that particular posting. 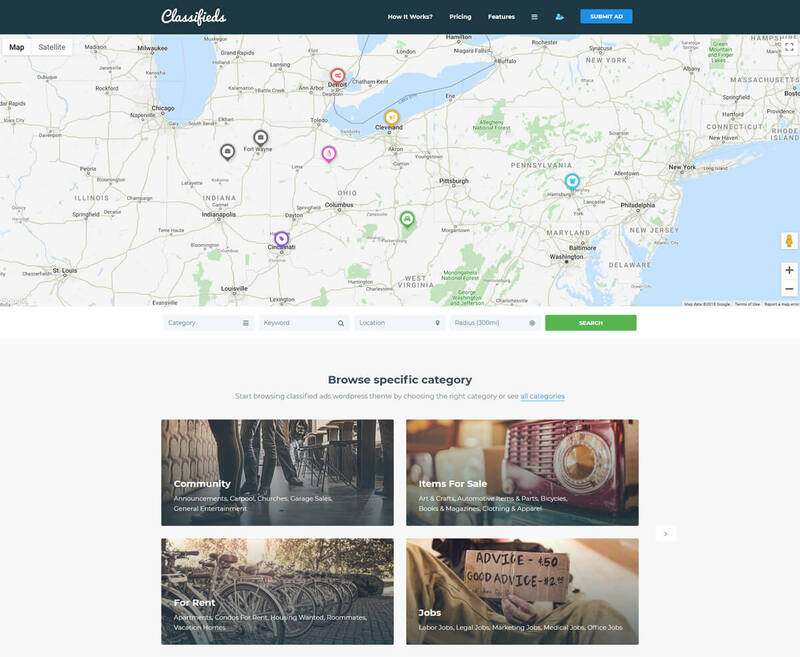 You could be mobilized the Google map of this WordPress theme. This theme has ample modern features like SMS verification is included here. You have an option to use multi currency, bump up ads and so more. Let’s see AdForest features! 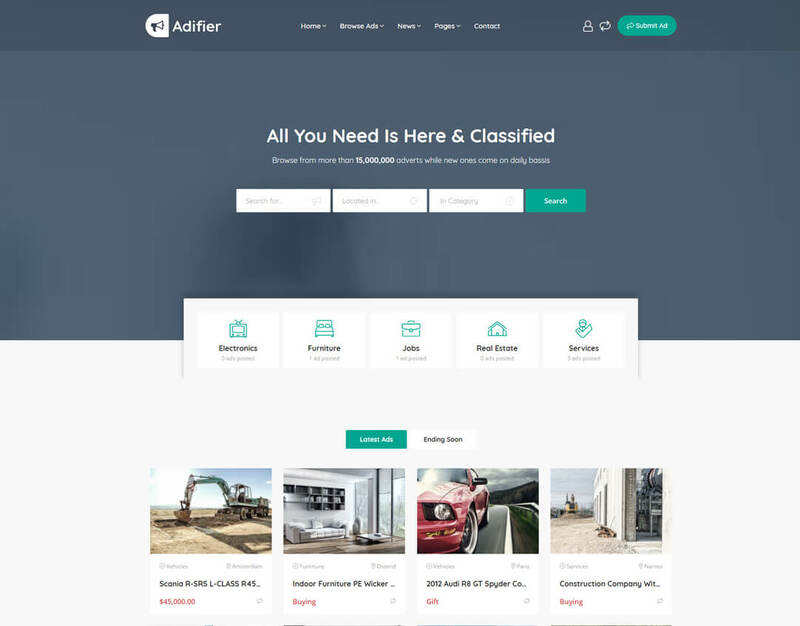 Adifier is a well craft responsive features WordPress theme for classified website. The theme is made in such a way to fill up your demand. You can posting in a sequence as you want . That means you have the opportunity to configure the theme according to your demand. You can will get the payment option and this is one of the main features of the classified sites. Like you can charge the fee who are listing their product of your site. How to collect the fee it depends you. Adifier is given a futures that you can import the list of XML or CVS format. It has amazing massaging system through which the users can communicate with others easily. The uses have control their own dashboard where they can see the visitors of their add, review or can change the information if they want. Let’s see the features of Adifier ! 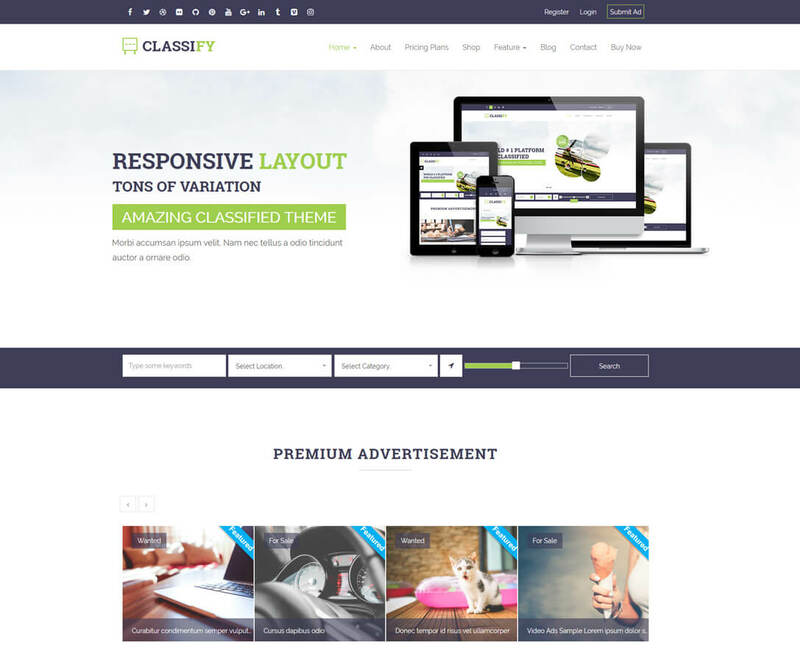 Classify is responsive flexible come with a reasonable most powerful theme which is listing the best WordPress themes for classified sites. It contains everything which are need in classified site. Classify is fully SEO optimized and it is very useful today’s to increase popularity. Classify has advanced search features and it makes goods users experience. For this, you will get “widget for advanced search” along with “custom field”. It has WooCommerce for payment system. You will get option like Pay per post or if you interested to set a ads plan for pricing, you will allow it. Google map help to identify exact location of particular product place and it will be really help to trace the location who are interested to buy that particular product. Let’s see more features of Classify! 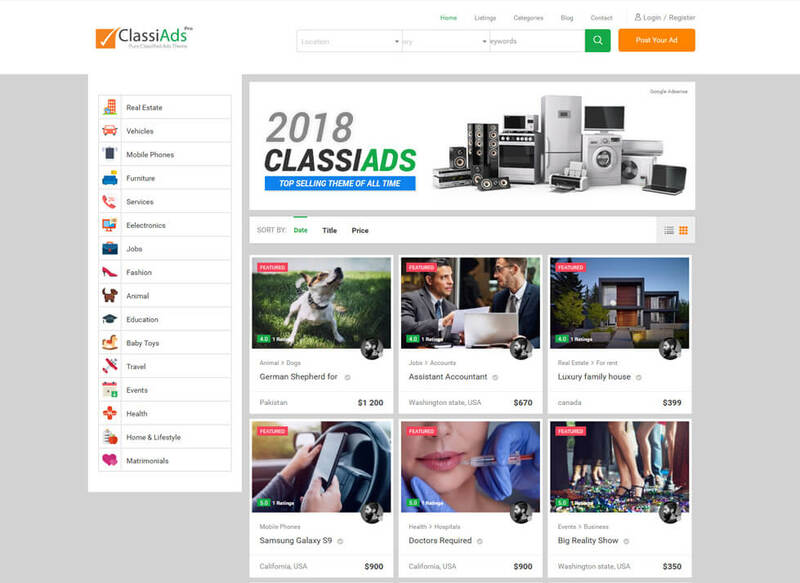 Classiads is modern spanking responsive WordPress theme for classified ads. You will get “twenty” plus pre built home page for your classified site. It is massive update theme, recently it is 5.2 version along with powerful admin panel. Through this panel you have the authority to change your classified website or configure some features. You can add new location system, import & export CVS format and make the listing into different category. Classiads give you more flexible, you don’t need to any extra plugin. “One Click Demo Install” help to automatically install plugin. You can save “Hundred Dollar” by purchasing this theme. “Ultimate Add ones”, visual composer, amazing slider revolution and so more are including among $100. Let’s check its more features ! Classiera is produced by the JoinWebs who are listing in Elite Author. As they are elite author defiantly when they developed something it was good. 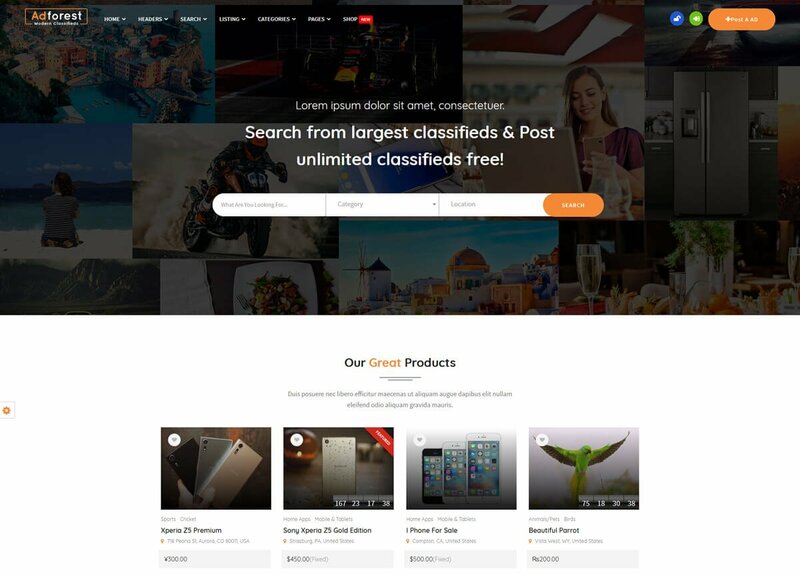 Therefore, Classiera is introduced the best WordPress theme for classified ads by adding modern features. The theme is responsive and the clients can see any device and upload any product for selling. The buyers can also buy any product from the listing at any device. The pricing plan could be pay first or per post or other options, you can do it. Classiera offer fantastic bid system. The owner of the theme can defilade or display publicly the bid option. When someone interested to submit the ad bid, the admin will get bid the notification through mail. In addition, user verify and so many option are included here, you just see the features prior to buy any classified theme! Trade is a modern well craft responsive WordPress theme for classified ads. The modern perception entrepreneur who are interested to launch a fantastic classified site, then they can keep Trade of their the first choice. Because it have lots of upcoming features. They will get multi-purpose portal for classified site. Trade is ready to give you different experience by showing different of homepage. Everyone want to keep some different things in their site like Title along with image VC element or someone want to title with icon. You may do anyone which is your most preferable. You can change the skin color or front color of your classified website through unlimited color option. There are more some key features are waiting to give you surprise. Let’s see !